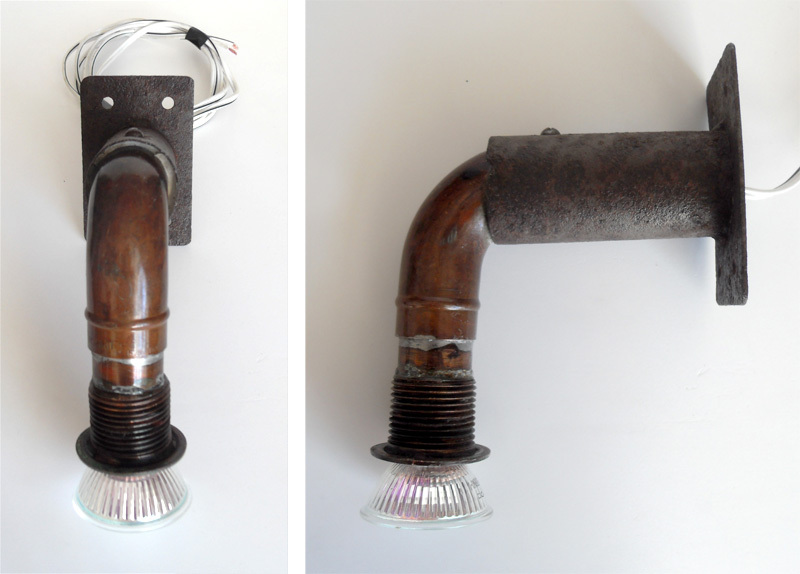 Bespoke steampunk lamps for sale! Things have been very busy here over the last few months on the design /making front (despite the criminal lack of write ups about it!). In particular, my range of hand-made / bespoke lamps (many in a steampunk style, but all made in my usual style of using found and recycled items) have been proliferating and reaching some new audiences. I’m currently working on a dedicated on-line display for them (complete with proper photography – the ones below are just some quick snaps which don’t do them justice, I am afraid, but in the meantime, for your amazement and delectation, here are three of my latest and finest. …perfect Christmans gifts for your light-loving friends and relatives! Each have different price tag and would require specific postage and packing adding (depending on where you live and the size and weight of each lamp) – please contact me for any and all queries (I’ve not included sizes here so plead ask for a full list if these), a no-obligation chat or to discuss having a bespoke item made for a particular gift or use. This is my latest creation! A cast concrete base holds a nicely curved brass tube upright, which eventually joins a copper pipe lamp holder. Two UK 2p coins cap off the head of The Mantis. This is also my first lamp where the cable is visible / an integral part of the design – brass eyelets funnel the cable from the fitting down and away from the base. Shown here with a small 20W halogen, it can be use with a larger 20W halogen bulb if desired. 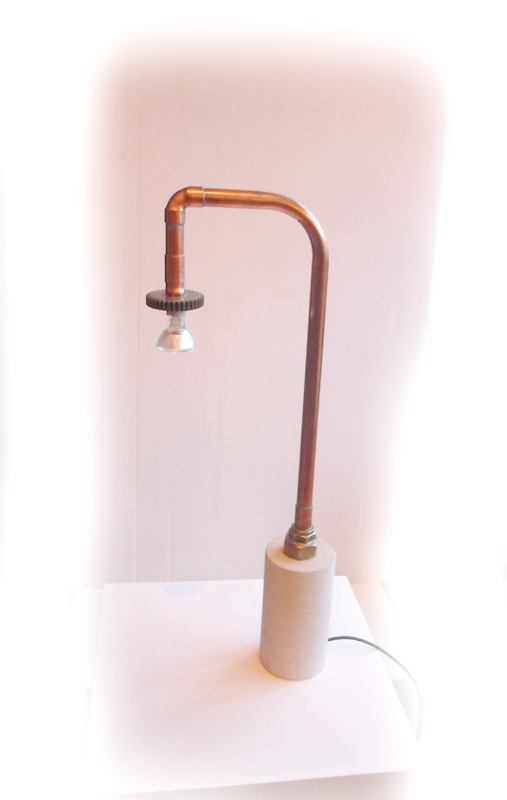 I love this piece!… A rusted iron bracket and tube becomes a copper pipe and brass fitting lamp holder. This looks great on either a very plain, modern wall, or works equally well from a dark coloured, rustic setting. The lamp attaches to the wall by four screws – the wire needs to be chased into the wall or fed into a guiding hole through. This piece was inspired by the interior design style of a villa I recently stayed in – the name is a tribute to the location. 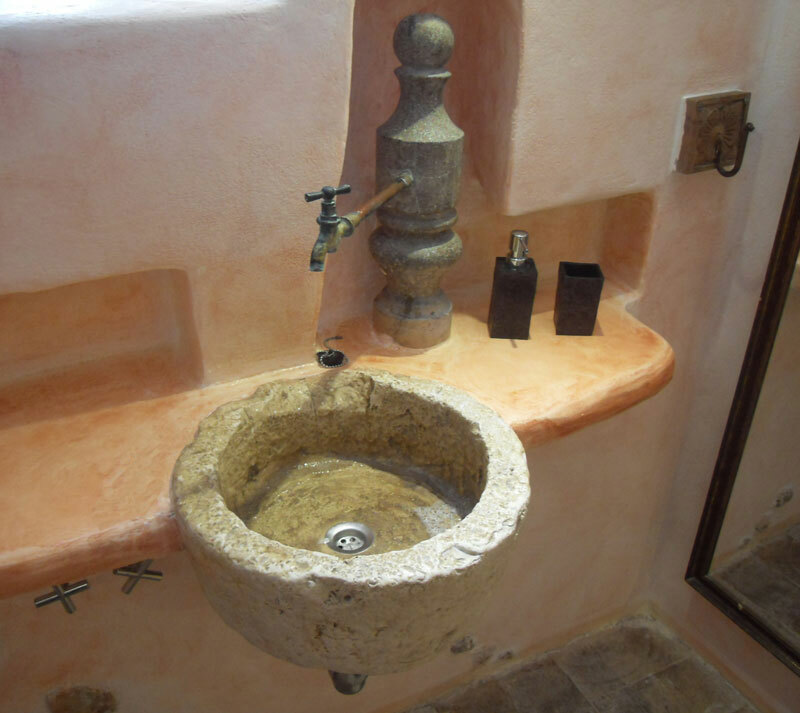 Built from a stoneware base (once an old liquid soap holder! 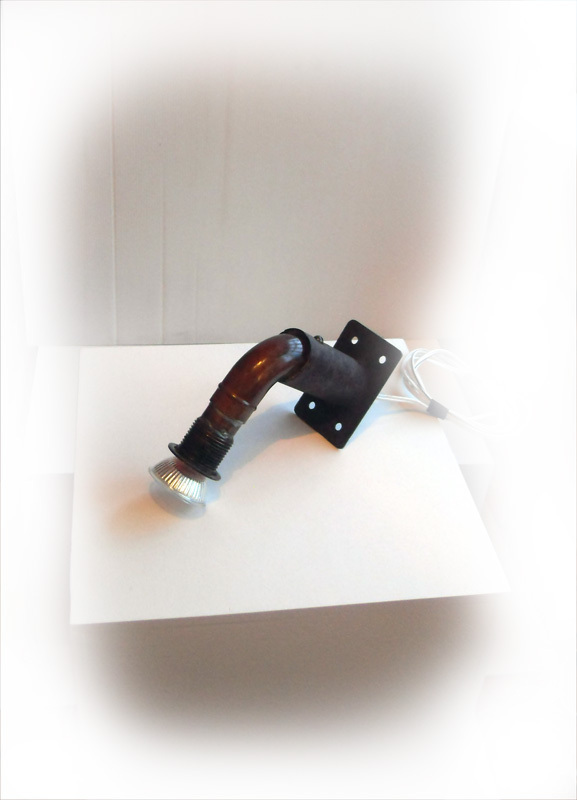 ), an elegant copper tube and set of elbow joins end in a heavy steel cog lamp holder. The lamp looks great with a small, 20W bulb, or equally at home with a larger ad brighter 20W version. I’m really chuffed to have just learned that I’ve had two of my sculptures accepted into the forthcoming 2013 University of Hertfordshire ‘Eastern Approaches‘ exhibition. 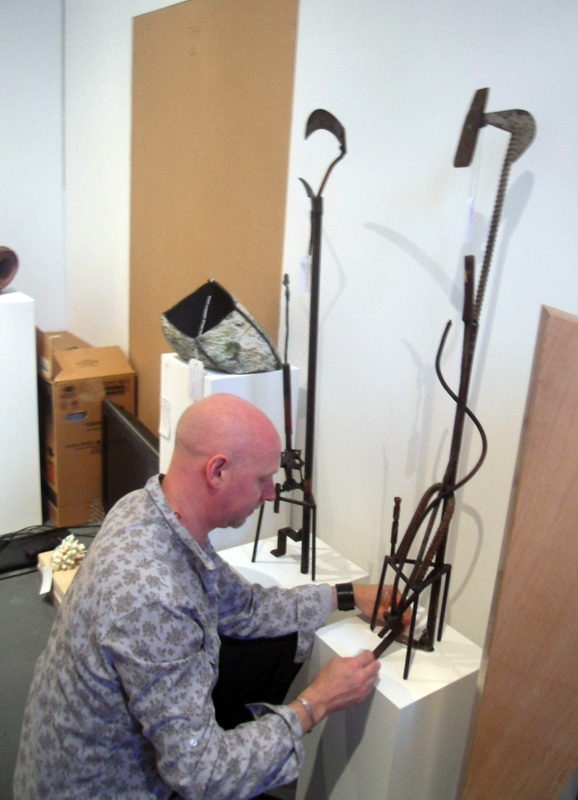 The works will shortly go on display in the exhibition at the Museum of St Albans, which runs from 5 December 2013 – 12 January 2014. 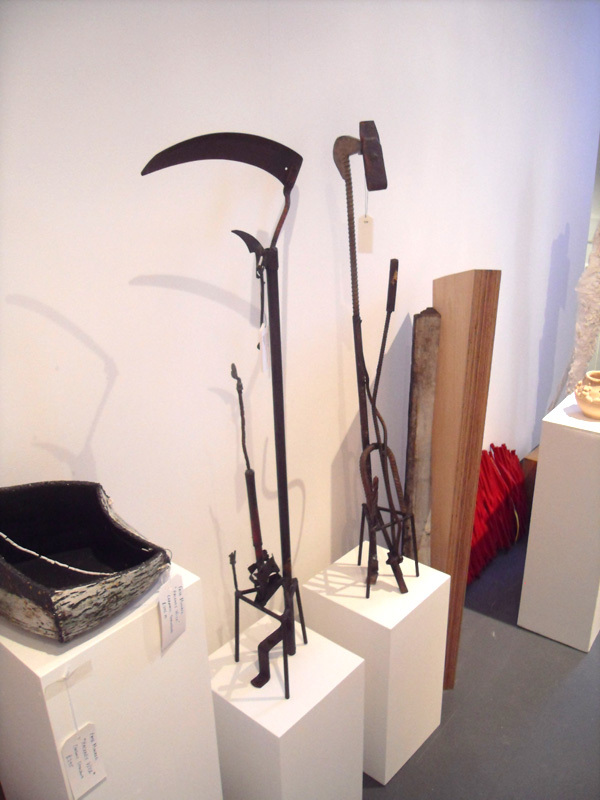 Here’s a very quick shot of the sculptures (in the centre) during the judging process – I’ll post some better ones up once the main exhibition has been arranged. Receiving critical acclaim, UH Galleries has been extremely successful in its programme of exhibitions this year, and is fast becoming one of the most innovative contemporary art spaces in the UK. As well as exhibiting a range of established and international artists, our vibrant spaces also aim to target members of the local and regional community. Over the last thirteen years Eastern Approaches has marked itself out as the definitive annual showcase for regional artistic talent. Do come visit it if you are in the area!! 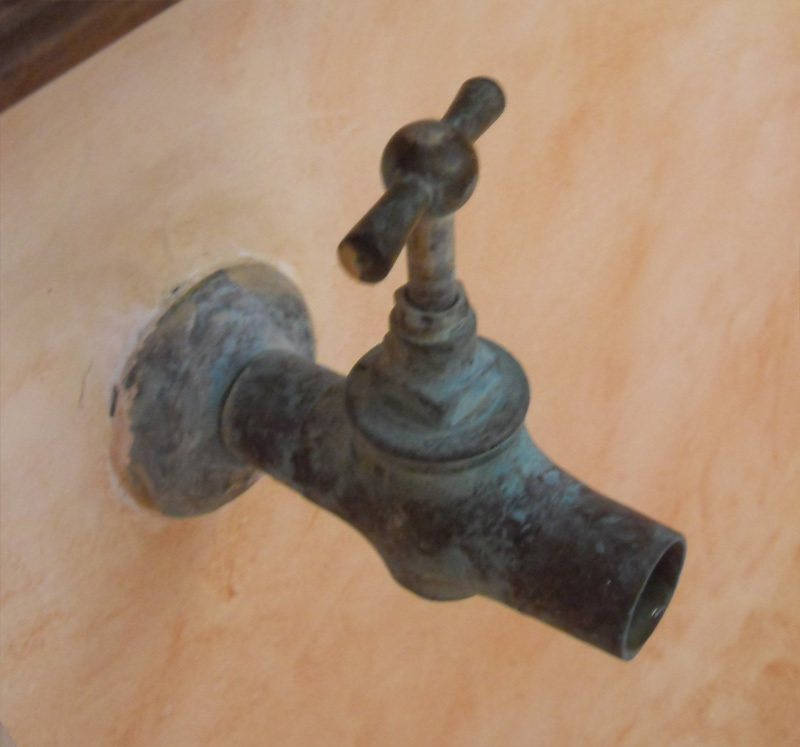 Here are few quick shots of some very clever and lovely, yet extremely rustic, uses of old copper pipe and brass taps… within what proved to be very up market and luxurious surroundings!! 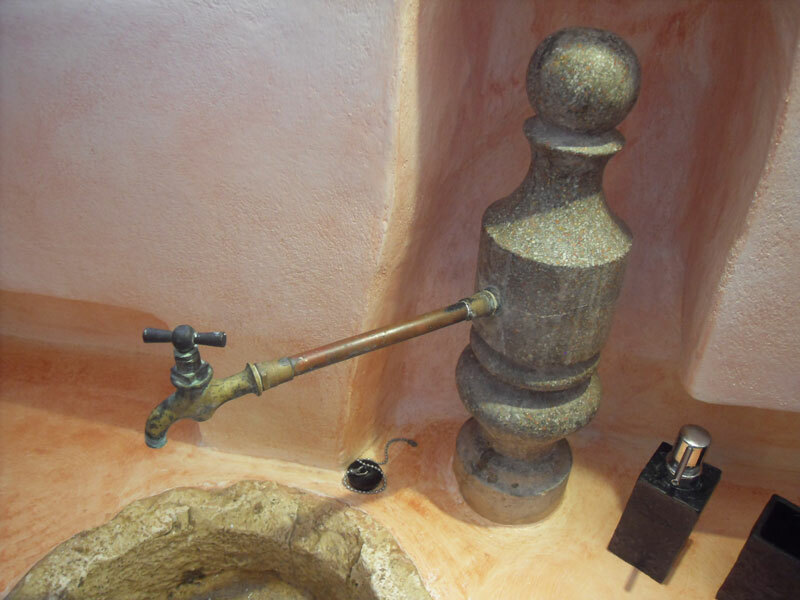 Despite being used to great effect (in a very stylistically designed interior of a luxury holiday villa) all these items look like they have been built from bits and pieces found in my local skip… manna from heaven!! I spent a lot of time fiddling with them for their form and design – sometimes I even had a wash with them! I am sure they cost a lot of money to source, import and install, but I think they give hope and inspiration to all us ‘found item’ designers and makers out there!